Twin brothers last week pleaded guilty in 27th District Court in Wyandotte, Michigan, for poaching walleye from the Detroit River. The two men exceeded their legal limit by 65 walleye. Michigan Department of Natural Resources conservation officers received the original poaching complaint in May 2018, from a source who called the DNR Report All Poaching hotline. The caller reported that two anglers – 54-year-old Benjamin Schrouder, of Ada, Michigan, and Steven Schrouder, of Lowell, Michigan – were filleting fish at a dock located at the Libra Marina in Wyandotte, Michigan. The witness followed the anglers in his boat and watched them fillet the fish, place the fillets in a dockside cooler, return to the river to continue fishing, and then repeat this process three to four times. Conservation Officer David Schaumburger contacted the witness, who provided a description of the two men, their boat and the back and forth locations. Schaumburger drove to the Wyandotte boat ramp in an unmarked vehicle, where he watched two anglers matching the description take their boat out of the water and load it onto a trailer. Schaumburger drove behind the suspects, following them about 200 yards to the Libra Marina. At the marina, the suspects began taking several bags from a dockside cooler, which Schaumburger suspected were the reported fish fillets. Conservation Officers Adam Beuthin, Keven Luther and Danielle Zubek were on patrol nearby and met Schaumburger at the marina. The COs approached the anglers and questioned them, which led to a search of their coolers. The coolers contained multiple bags of fresh, unfrozen walleye fillets (totaling 75 fish), along with undersized walleye carcasses. The legal walleye limit on the Detroit River is five 15-inch walleye per day. In addition to one day’s daily limit, a person may possess an additional two daily possession limits of fish taken during previous fishing days, provided that the additional limits of fish are processed (canned, cured by smoking or drying, or frozen). The officers seized the fish and issued citations to the poachers. Schaumburger continued the investigation by receiving a search warrant for one of the brothers' phones. That phone’s GPS records produced additional evidence. “Thanks to officers Beuthin, Luther and Zubek for teaming up with me. If it weren’t for our collaboration, we would not have made this case,” Schaumburger said. After failing to appear for their court date, a bench warrant was issued for both men. Conservation officers located and arrested the two brothers last week. They were arraigned in court and each was ordered to pay $2,070, including $700 in reimbursement for the over-limit of fish and $20 in conservation fees, along with having their fishing licenses revoked for one year. Reimbursement is calculated by weighing each individual fish, assessed at $10 per pound. The Detroit River is a world-class walleye fishery, particularly after the spring spawning run. Anglers are reminded that when fishing waters that border neighboring provinces and states, they may possess only the limit allowed for one license while in transit and must comply with Michigan fishing regulations while fishing Michigan waters. Anyone who witnesses or suspects a natural resource violation is encouraged to call or text the Report All Poaching hotline at 800-292-7800. For information about fishing opportunities statewide, visit Michigan.gov/FishingGuide. 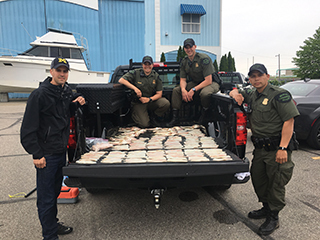 Walleye poaching-Detroit River-May 2018: Conservation Officers David Schaumburger, Danielle Zubek, Adam Beuthin and Keven Luther caught two men poaching walleye from the Detroit River in May. The fresh, unfrozen fillets totaled 75 walleye – the poachers were over the legal limit by 65 fish. Officers located and arrested the poachers last week for failing to appear in court and pay their fines.